World AIDS Day, observed on 1 December every year, is dedicated to raising awareness of the AIDS pandemic caused by the spread of HIV infection. Government and health officials observe the day, often with speeches or forums on the AIDS topics. Since 1995, the President of the United States has made an official proclamation on World AIDS Day. Governments of other nations have followed suit and issued similar announcements. AIDS has killed more than 25 million people between 1981 and 2007, and an estimated 33.2 million people worldwide live with HIV as of 2007, making it one of the most destructive epidemics in recorded history. This theme is not specific to World AIDS Day, but is used year-round in WAC`s efforts to highlight HIV/AIDS awareness within the context of other major global events including the G8 Summit. World AIDS Campaign also conducts "in-country" campaigns throughout the world, like the Student Stop AIDS Campaign, an infection-awareness campaign targeting young people throughout the UK. Different governments and organizations have declared different months as AIDS Awareness Month. The most popular choices are October and December. 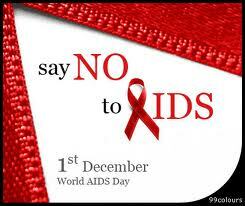 December is chosen to coincide with World AIDS Day.